These delicious pancakes are made with the help of some ready-prepared products from the chiller cabinet for an easy Pancake Day with a difference. Melt one of the chocolate puds according to pack instructions. Sift the flour into a bowl and mix in the egg and milk, followed by the melted chocolate pud. Use a balloon whisk to combine well. Dip a piece of rolled up kitchen paper into the oil and rub over an 18cm pancake or crêpe pan, then heat over a moderate heat. Pour 2-3 tbsp of the chocolate batter into the pan, tilting it so that the batter covers the base thinly and evenly. Cook for about 1 minute, or until the pancake is set and coloured underneath. Loosen the edges with a palette knife then either turn the pancake over or toss. Cook the second side for about 30 seconds, or until just set. Slide the pancake onto a plate, cover with baking parchment or foil and keep warm. Use the oil to cook the remaining batter in the same way, to make another 7 pancakes. Add each one to the warm plate, layering with baking parchment. 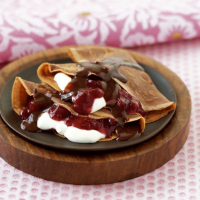 To serve, fill each pancake with a spoonful of compote and a small dollop of crème fraîche before folding into quarters. Heat the remaining chocolate pud, as before, and drizzle over the pancakes. To freeze, layer the cooked pancakes between baking parchment and wrap in foil before freezing for up to 1 month. Reheat the defrosted pancakes in the oven before filling.